On Sunday, during the Japanese Grand Prix, I was live blogging for this website and also writing notes for the race report. As the race neared it’s end, I began writing a proper report in order to get it online soon after the race. However; the events after the red flag that ended the race made me think twice; it seemed wrong to talk about anything else that had happened. I felt I couldn’t write properly, it was all a bit ‘flat’. I didn’t want to post anything up talking about racing, talking about a championship battle, talking about anything. At least not while we were unsure of the health of Jules Bianchi. Since his accident, the Formula One community has rallied and come together to offer support to him, his family and the Marussia team. Now, he’s far from out of the woods; brain injuries are always serious, I know. But we know that he is in the best hands he can be in; and that it could have been much, much worse. So now seems like a good time to reflect on other events this past weekend, whilst keeping Jules in mind at the same time. Everyone knew it was coming, we just didn’t know how heavy or for how long. Pre-race it was obvious that wet tyres would be needed to deal with the rain. As the cars made their way to the grid, Perez went off into the gravel and shortly afterwards the announcement came that this would be a safety car start. Gazebos out on the grid over the cars, the rain got heavier. And heavier. Standing water in many places raised questions as to whether anyone would go racing today. No formation lap, Bernd Maylander got the ‘race’ underway in his Mercedes safety car – not the Mercedes we had thought would be leading! Within two laps Sebastian Vettel aquaplaned at only 80kph, and Caterham’s Marcus Ericsson spun 180 degrees. With this happening at slow speeds, the red flag was brought out and all cars lined up behind the safety car in the pit lane. Unsure of when the race would start again, the gazebos came out to cover the cars and almost instantly the rain eased up. The ten minute klaxon sounded and confirmation came from the FIA that the race would be re-started under the safety car. Frustration for the fans, but it was the right choice given conditions at the time. Red Bull were feeling confident as they had a set up more geared towards wet weather, having anticipated it on Saturday. Mclaren were also feeling upbeat about their drivers’ chances. Spotted before the restart by the cameras in the pits were team bosses Wolff, Boullier and Horner (Mercedes, Mclaren and Red Bull, respectively) having a chat that whilst inaudible, seemed informal and light hearted. It’s good to know competition doesn’t override the human factor in this sport. As the procession left the pit lane, it took all of four corners before Fernando Alonso’s Ferrari had what looked like an electrical shut down, and he pulled over to retire. A terrible weekend for the Spanish double World Champion. Some drivers had concerns over brake temperatures under the slower speeds of the safety car, namely Lewis Hamilton but after 8 laps; real racing got underway. With fuel no issue, the Mercedes pair stretched their legs a bit and pulled out an early lead. Jenson Button decided to pit instantly and went on to intermediate tyres. It only took three or four laps for it to be proven an excellent decision, and with a raft of stops afterwards, Button found himself best of the rest in third place, behind only the Mercedes pair. Surely he couldn’t replicate his win at Canada in 2011? Pit crews found themselves incredibly busy in a three lap period where almost every other driver stopped. With pace in their pocket, the Silver Arrows chose to stop later than the rest of the field and went on to intermediates. Rosberg, as leader got the call to pit first. It looked as though Hamilton may have been able to jump him, but it wasn’t to be. He ran wide at the spoon curve and came out of the pits just behind his team-mate, although a lot closer than he was beforehand, before dropping back a little. Settling down after the round of stops, it became clear that Williams did not have their cars finely tuned for the conditions as they were comfortably passed by both Red Bulls. Vettel made it look easy, but Ricciardo passed both white Martini-liveried cars in beautiful fashion, closing up through the ‘S’ bends and then passing on the inside of Dunlop, in consecutive laps. Kevin Magnussen had a nightmare, having to change his steering wheel at the pits, which put him well down amongst the Marussias and Caterhams. Out front, Lewis Hamilton began to ebb away at Nico Rosberg’s lead as the intermediate tyres started to wear and took full advantage of DRS being enabled; getting himself within three tenths of a second of the lead. Traction looked like being a problem for Rosberg, who was taking different, quite wide lines through corners in order to maximise grip. After tussling for a while, Hamilton got very close in the chicane. Nico Rosberg chose to take a defensive line down the start/finish straight, covering the inside line, but Hamilton had the pace on the racing line to put his car round the outside into turn one; and still had enough stopping power to close off Rosberg into turn two. Two laps later, having lost almost four seconds to Lewis, Nico pitted for the second time. He went with inters again when there were rumblings of people changing to slicks, and when Hamilton stopped soon afterwards, also went for inters. The rain came again; firstly falling as a misty drizzle, before becoming quite heavy. This put to bed any idea of slick tyres. Around the second stops, some drivers got brave with their moves. Danniil Kvyat, elevated to Red Bull for 2015, found his way around Adrian Sutil on the wet side of the track, despite his car threatening to snap and send him into a spin. Jenson Button relinquished his third place at his second stop after Mclaren’s second five-wheel stop of the race, whilst his team mate ran wide at turn two and pirouetted on the wet astroturf. Both Red Bulls meanwhile, moved up into third and fourth, before Vettel ran wide in the esses and ran over the gravel trap, losing valuable time. With the rain getting heavier and the track getting wetter, thoughts shifted from intermediates to wets. Gambling on another stop would add real spice to the fight for this race. Ten laps before the end, Adrian Sutil was struggling for grip in his Sauber and spun backwards into the barrier at the Dunlop curve. 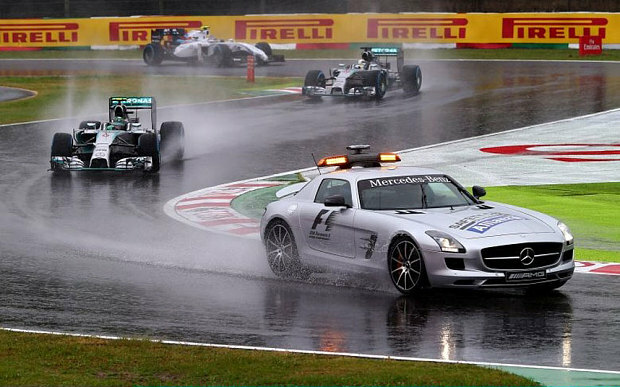 Then, seemingly without warning, the safety car was deployed again. The medical car was also despatched and made it’s way up to the scene of Sutil’s innocuous accident the lap previously. An ambulance joined them on the inside of the track; the only speculation at the time being that a marshal had been injured. Only the eagle-eyed (not including me) saw a flash of Marussia bodywork behind the still recovery truck next to the stricken Sauber. A darker atmosphere descended over Suzuka, along with the clouds. Shortly afterwards, the second red flag was brought out and it was announced almost instantly that the race would not be restarted. 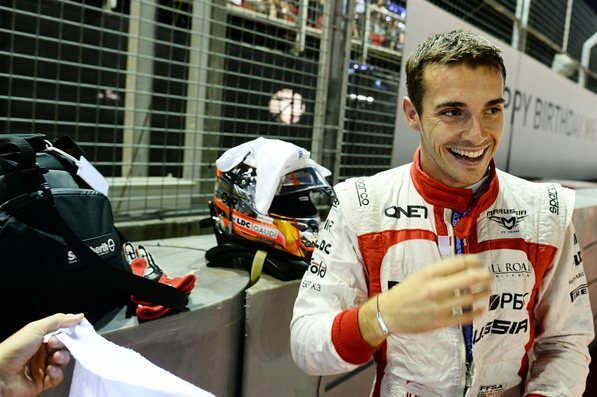 Jules Bianchi was rushed to the medical centre and then transferred to hospital. We hadn’t seen anything like this in F1 since Felipe Massa’s freak accident in Hungary 2009. On that occasion we found out relatively quickly that Massa was okay. The news on Jules Bianchi’s condition was scarce, which only seemed to instil fear in everyone involved; and everyone watching. Drivers didn’t want to talk about the race, team bosses were not concerned about points. The podium was subdued, no champagne was sprayed – even though the authorities did their best to pretend nothing had happened by playing celebratory music. Everyone waited nervously to hear of news for the rest of Sunday; before hearing that Bianchi had undergone surgery and was breathing on his own. I join many in wishing Jules Bianchi a safe and quick recovery. I sincerely hope we see him on the grid again, he is still a young driver with a lot of natural talent, responsible of course for Marussia’s only points in F1 in Monaco earlier this year, with a ninth placed finish. F1 moves on to the next race in Sochi, Russia this weekend, for the first Grand Prix in the country for a whole century.